It’s the 1960s in LA. 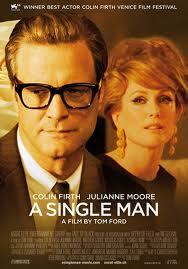 Colin Firth plays George, a college professor whose male partner of sixteen years has recently died in a car accident. He is distraught, and forcing himself to go through the everyday motions of his life. Charley (Julianne Moore) is his close friend and neighbour who is recovering from divorce and Kenny (Nicholas Hoult) is one of his students with whom George forms a strong connection. This is a very beautiful film; slow and gentle, yet quite heartbreaking. One thing that did bother me was the use of light in the film; there were several points in the film where it was far too heavy-handed. Clearly, it was representing George as being in the dark of his own depression and Kenny as the new light, a ray of hope, but it would have benefitted from being far more subtle. The film was directed by fashion designer Tom Ford, and this explains the pure beauty of production and cinematography. It’s like watching good art; beautiful and moving.